I highly recommend getting boys hooked on book series when they are young. Getting them interested in book series at a younger age is a super way to help ensure they will continue reading series as they get older. However, if you have an older boy who never really caught on to the wonder of series, do introduce him to them now! It is never too late. Read the top 5 reasons for getting your son hooked on great book series for boys, go through the lists at the bottom of this article and our best books for boys lists, and sit back and watch your boys devour book after book after book. I love a good book series. Getting started on the first book, turning page after page, learning more about the characters, setting and plot line is exciting. Knowing that I have another great book waiting for me when I turn the last page of that book is something that I relish. Your boys can have those same feelings about reading. 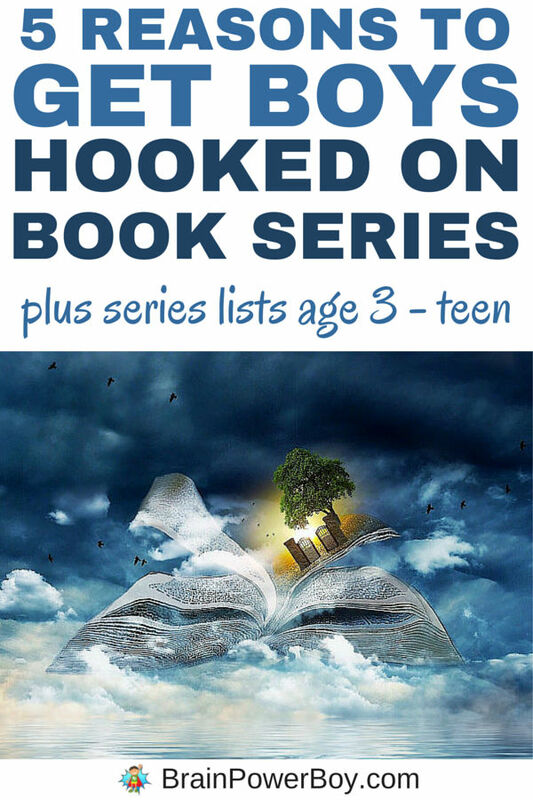 Here are our top 5 reasons for getting boys hooked on book series. Well, other than the obvious reason that book series are just so much fun to read. That really is the best reason to have your boys read them but here are some more super reasons that matter. Book series make it easier to find books he will like. If you find a series he enjoys he can keep going through the books until he has had enough or until the series ends. You don’t have to go through trying to find another book he likes quite so soon. There is a built-in supply. The more they read the better they get at reading. Book series are designed to pull a reader from one book to the next book in the series. They are the perfect type of book to ensure your boy will read a lot more pages. And speaking of more pages, think about this number: 4,224. There are 4,224 pages in the Harry Potter Series. The shear number of pages boys read when they get into a series can be pretty impressive and reading that much does indeed make reading easier and make them better readers. Memory skills are developed in a long series. Unlike magazines, Internet blurbs and short books, series books have a lot of things you need to remember in order to follow the story line such as character details, plot, locations, facts and more. This helps boys to stretch their memory muscles a bit. They start to recognize the patterns in books. They understand the characters, plots and sequences better because in a series they will be repeated and become familiar to the reader. Because these are familiar, they can examine other aspects of an author’s writing. The more details they notice, the more likely they are to use that type of detail in their own writing or communication and the easier it is for them to read a wide variety of book styles. They help build reading confidence. Going back to the 4,224 pages in the Harry Potter series, I still marvel at how quickly my son read through that large number of pages. When a child reads a whole series of books make note of the number of pages they read. If they approach a book they might want to read, but think it is too long, you can tell them they read a series that was over 500, 1500 or even 4000 pages long! Reading a book series for boys makes them a better reader. It is as simple as that. I believe that if you try a few different series, and find one that your boy really likes, you will see a bit of reading magic occur. Use these lists to help get your boy hooked on a wonderful series! Oh, how I love a good series! Not having to say goodbye to characters you have come to “know” is the best! Series filled years of bedtime reading out loud at my house, as well as independent reading. Our shelves are still filled with our favorites that we can’t possibly give away. 🙂 I love your book list and so will all the boys lucky enough to be introduced to the great books on the list! Thanks so much Wendy. Your house sounds a lot like mine. I too love series as does my husband and my son. I know what you mean about hanging on to those favorites, so many good memories of snuggling and reading together. This is such a good idea! My boys are younger, but they’re already into different “series” like Thomas the Tank Engine and Curious George. Thanks for the suggestions to keep them reading as they grow! This is great! We are huge readers in our family. My boys are 3 and 5 and they love spending time with mom and dad reading a good story book! Tennille – thanks so much for your nice comment! I am so happy to hear you have a reading family and that your boys enjoy reading with you and your husband. I really believe that reading builds such wonderful memories. My boys (and myself) prefer reading series because we feel we really get to know the characters too! I love knowing they’ll be busy reading for awhile as they always seem to flounder between series. I love series myself and that is exactly why. I like to dive deep into the lives of the characters. I sometimes read a few non-series books between big series. Not sure if that will help you in choosing things for your boys, but I like to find just the right series and sometimes that takes time! Thanks for stopping by. I hope you find some good series for your boys. Have a lovely day.